Version 5.0.x.12 of GTVx is available. - FIX - The Export button on the Display Preset Dialog was always enabled even when no preset item was selected. - FIX - QueryActivate and QueryPerform were not recognizing Query Type 13 as thematic query. Version 5.0.x.27 of GTViewer is available. 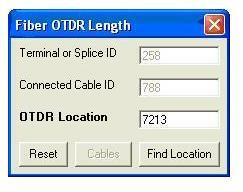 - CHG - Change to the NMEA GPS reader to better support virtual COM ports or GPS sharing devices. Version 5.0.x.26 of GTViewer is available. - FIX - Export as Dgn was not setting the origin correctly in orphan cell headers which caused all grouped elements from the GTViewer data to scale and rotate incorrectly in Microstation. - NEW - Export as Dgn will now export Extended Style Information as UDLS tags on the dgn elements. - FIX - Fixes to the Style Manager's Import Map and Def funtionality. - NEW - ExternalStyleMapFile and ExternalStyleDefinition entries can be added to the addprop.ini file or the Additional Properties section of the .GTM. If defined, these entries will import the specified .map or .def files. - FIX - Text Elements with embedded data would lose the embedded data if edited with the Element Properties dialog. - FIX - Reading an element would partially reset a DrawSetData. It will now fully reset the information. - FIX - Right Mouse Menu would not activate when in Draw Dimension or Leader line modes. - FIX - Updates to Magnify Window to provide a smoother appearance when scrolling, especially with dark or black backgrounds. Version 5.0.x.10 of GTVx is available. - NEW - Export as Dgn will now export Extended Style Information as UDLS tags on the dgn elements.- FIX - Text Elements with embedded data would lose the embedded data if edited with the Element Properties dialog. Can Pocket GTViewer be a Usable Viewing Platform? Many people today still view Pocket PC or Windows Mobile devices as a novelty with little or limited practical use. There are generally 3 arguments against the handheld device for any application: 1) they are not powerful enough, 2) they can not hold enough data to be useful, and 3) their screens are too small to see anything (especially maps). I hope to dispel these myths and attempt to get more people looking at the handheld platform. Pocket GTViewer is an excellent application for the mobile community. If you are not utilizing this application in some way, you are missing out on a rich resource for viewing, data collection, and general accessibility to your GIS information. 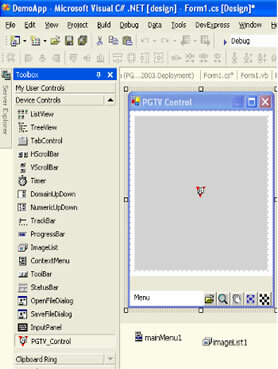 Pocket GTViewer has been in existence as long as the desktop version of GTViewer, and it has progressed through several generations of Windows CE. The first version of Pocket GTViewer, introduced almost 6 years ago, supported Window CE 2.11 and the processor of the time was the Hitachi SHO running at 133 MHz. Pocket GTViewer has since supported Windows CE 3.0, Pocket PC, Handheld PC 2000, Pocket PC 2002, Windows Mobile 2003, Windows Mobile 2003 Second Edition, Windows CE.NET, and now Windows Mobile 5.0 (Window Mobile 6.0 is coming soon). I list all of the different platforms to show how quickly the handheld devices are evolving. 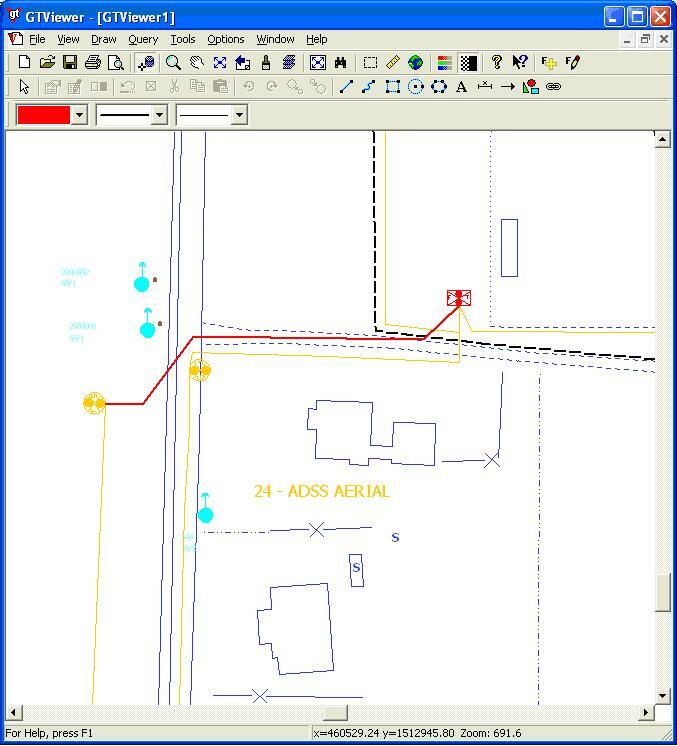 Let’s go through the arguments against viewing your GIS data on the handheld platform one item at a time and see how they are no longer valid excuses. The first argument is that the devices are not powerful enough. I think this argument has always been untrue. While the handheld devices are certainly not as powerful as a desktop PC, the devices of 6 years ago were more than capable of viewing complex vector map data. Pocket GTViewer was designed from the beginning to work with these slower processors and with minimal resources. On today’s handhelds, with processors 5 times faster, video hardware acceleration, and quadruple speed (or more) memory, Pocket GTViewer screams. The second argument is not enough storage. Six years ago this might have been partially true. CF cards of that time were commonly in the range of 16M to 40M and a 100M CF card could easily cost more than the handheld device. At that time, you had to be a little more selective with what data you took with you; however, 40M of GTViewer data is a lot of information and rarely did I see a problem with not being able to take all the data along that was needed. Also, the 1G Microdrive provided some relief early on for those who needed extra storage at a premium price. These mechanical drives were very fast and usable even if they were deemed a bit fragile and consumed some precious battery power. Today, storage problems are all out the window; 4G+ memory cards (CF and SD) are common place and 2G cards very inexpensive ($70 or less). Solid state, fast, huge, and non-volatile, what more could you ask for? The last argument is the usability of the screens which probably carries the most weight when deciding against the handheld devices as a platform. In the beginning, the standard Pocket PC and Windows Mobile screens are usually 3.5” diagonal with ¼ VGA resolution (240x320). If you leave the mainstream, there have always been a variety of screen sizes available; the only downside being that they are usually more expensive and use one of the more vanilla flavors of Windows CE (like Windows CE 3.0 and Windows CE.NET) which do not have some of the built in extras you find in Pocket PC and Windows Mobile. With the addition of Windows Mobile Second Edition, the screens are the same physical size, but they can now have full VGA (640x480) resolution and can operate in either Landscape or Portrait modes. This resolution increase is a much more profound change than it may seem at first. Going from ¼ VGA to full VGA quadruples the number of pixels in the same screen area and gives an amazing amount of clarity to graphics like the vector maps Pocket GTViewer displays. (This is one of those things you have to see to fully appreciate.) With Windows Mobile 5.0, the standard screen size is no long a standard and we see different aspect ratios. For example, the Treo 700w has a square screen. There are really two issues when it comes to screen size. One is the hardware limitation and the other is thinking “desktop” when you have a “handheld.” The hardware limitation is really not an issue now with the full VGA screens (and really never was with ¼ VGA screens either). The screens are still small, but they are now crisper than your desktop’s screen and can still fit in your shirt pocket. The second problem has to do with doing the right job with the right tool. If you are trying to view all outages in your service area, a 3.5” screen is not the right tool. The tool for this job is GTViewer or GTVx, not Pocket GTViewer. 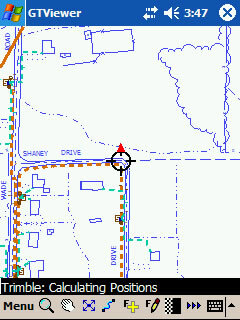 However, the 3.5” screen with ¼ VGA or full VGA resolution is ideal for viewing a map up close. 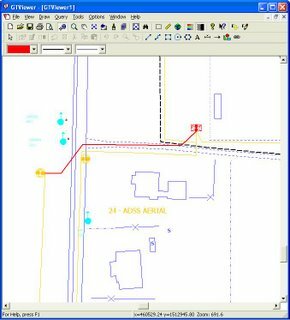 For example, you want to know if there are any underground utilities at an address, or you need to see what equipment is installed on a particular pole. A handheld device is like one of those little notepads with the wire spiraled around the top. You hold it in one hand and write on it with the other. So, what would you use a notepad for in the field? Taking notes, drawing sketches, filling out forms. 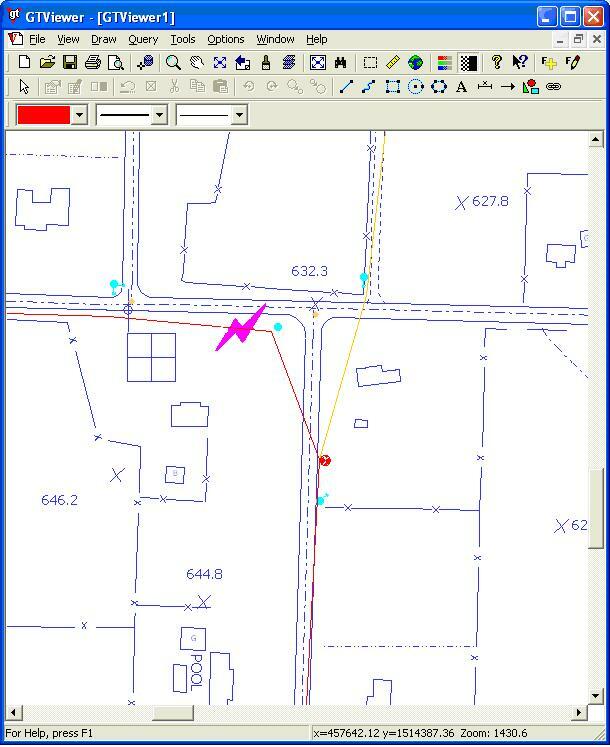 Couple these tasks with an intelligent map supported by all of your GIS data and you have a very power tool in the palm of your hand. Desktop GTViewer and Pocket GTViewer work well together. One is not a replacement for the other. 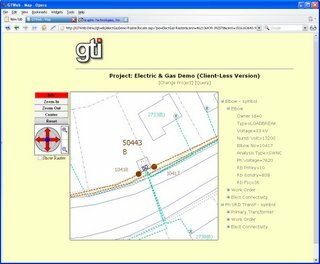 GTViewer on your desktop PC can extract data for the handheld to take into the field, and receive redlines and/or collected data. 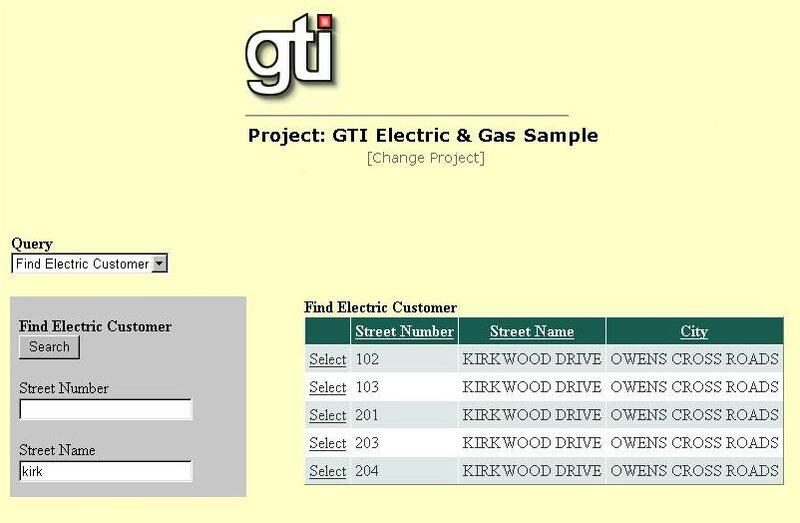 GTWeb is also integrated with Pocket GTViewer allowing a web interface for selecting and loading data. 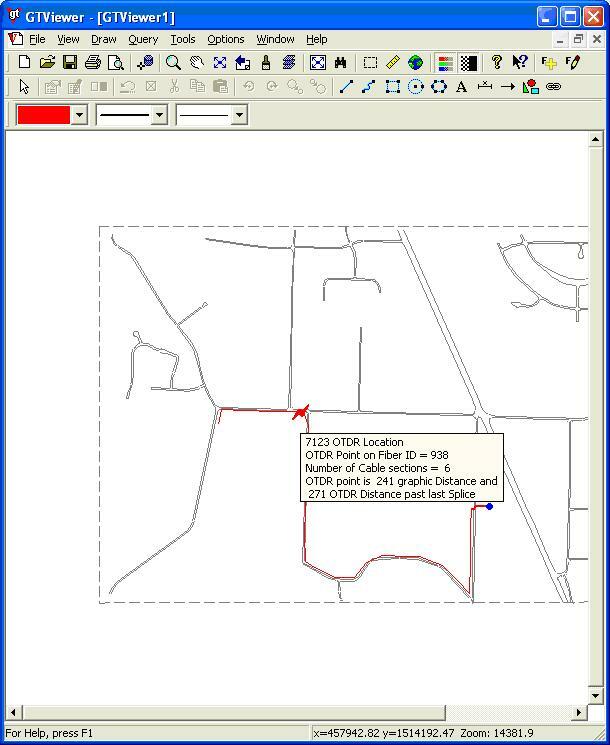 Pocket GTViewer extends your GIS into places that were not always accessible before. I always carry my handheld with me, but I only lug my laptop around when I have to. Having the right information at the right time can make all the difference in the world. The future is bright in the mobile arena. Beyond the Windows Mobile devices, we have SmartPhones and Ultra Mobile PCs. More and more devices today have built in GPS capabilities as well as cameras. Wireless connectivity is also becoming faster, more reliable, and more affordable. GTI’s product lines adapt to take advantage of the latest technologies available. You will see these new technologies leveraged in Pocket GTViewer, GTViewer, GTVx, and GTWeb. System administrators often need to provide information, in some way, to the people using GTViewer. There are three ways, and each is suited to a slightly different use. Each one is implemented as a parameter in the [General Info] section of the GTM file. Let’s take them in this order: Description, Message, then Disclaimer. 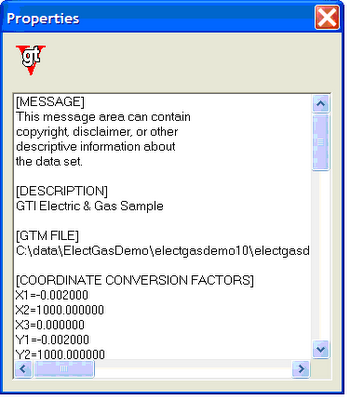 Message – This property can be used to specify text to be displayed in the File > Properties dialog in GTViewer and the GTV > About > Open File dialog in Pocket GTViewer. The Message entry can be repeated as many times as necessary and can be used for copyright information, disclaimers, etc. The example above of the File > Properties dialog shows both Message and Description. Disclaimer – This property can be used to specify text for a disclaimer that must be accepted before the data can be opened. The Disclaimer is limited to 255 characters per entry. It can also be set to <*blank*> to insert blank lines. The Disclaimer entry can be repeated as many times as necessary. Here are two examples. The first shows the use originally intended, namely, to require the user to actively accept a legal notice. 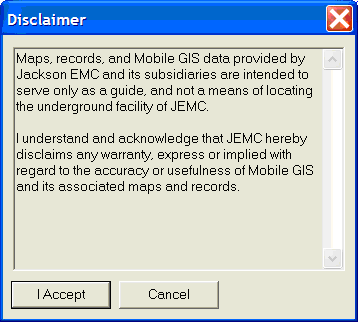 This is the actual disclaimer used by Jackson Electric Membership Corporation (JEMC). The same technique can be used to present users with notices they ought to read but might skip. 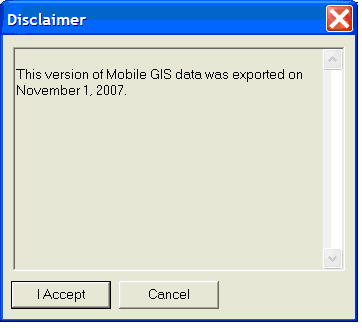 In this case, the administrator wants the people using GTViewer to know when their data set was exported from the GIS. If they accept, GTViewer displays the data. If they Cancel, GTViewer exits. I hope this blog posting has given administrators some ideas of how to inform users in the most suitable manner. And I hope at least a few readers were more amused than outraged by my distortion of Elizabeth Barrett Browning’s sonnet. The new version of GTWeb now provides a client-less mode of operation that makes it browser independent. Today, the three most common browsers are Internet Explorer, FireFox, and Opera. So, if you are fond of particular browser, if you are forced to use a specific browser due to corporate directives, or if your web app is for the public browser selection is out of your control, the new GTWeb client-less mode of operation addresses these needs. Previous screenshots of GTWeb 5.0 have been with Internet Explorer 6.0, so the ones below are all using different browsers. 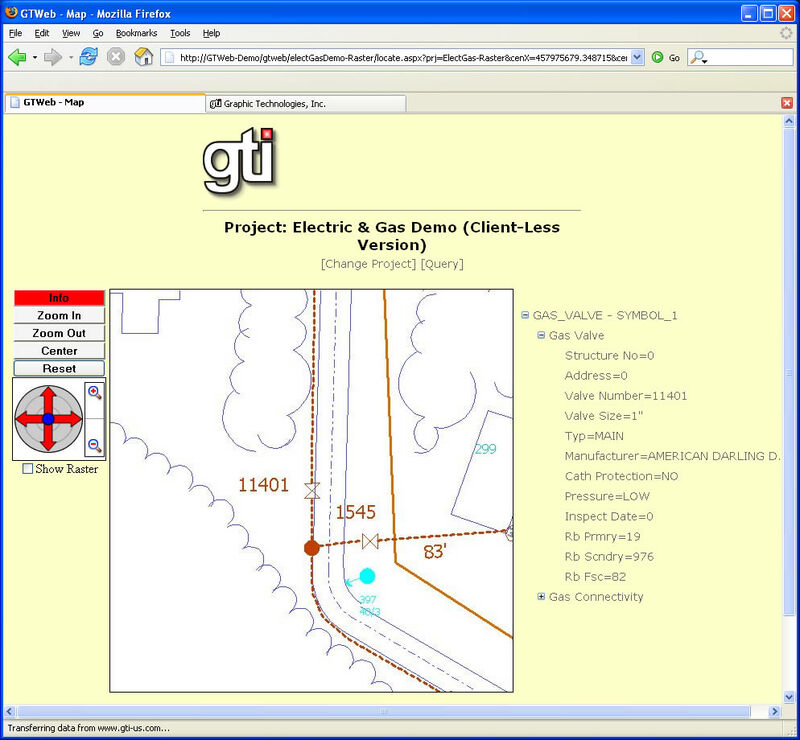 A Press Release for GTWeb 5.0 can be found on GIS Cafe. Version 5.0.x.22 of GTViewer is available. - NEW - Intersection Query now supports more than 3 prompts. 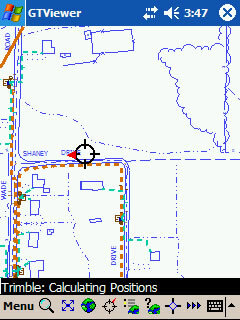 - CHG - GPS dialog was changed to have a Track GPS in View option and a Show Indicator option as well as an Indicator Type. 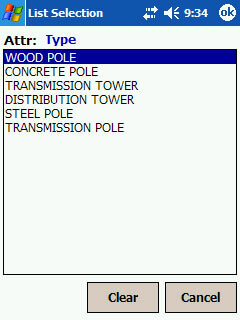 The Track GPS option has also been added to the toolbar. 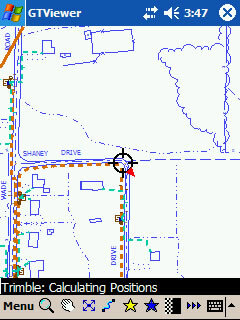 - CHG - GPS Leave Trail is now persistent between runs. - NEW - Shape with Holes elements now supported styled lines for their borders. - FIX - Connectivity Query and Offset Query would not find a record if it were the first record in the file. Problem introduced with very large .gtx file support was enhanced (4.0.0.16). 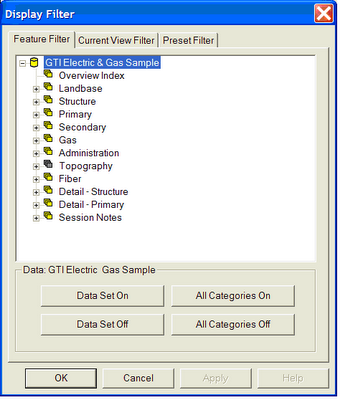 Version 5.0.0.4 of GTData will include a new utility called GTFilterImp. This utility will import the customizable settings (including display status, minimum display threshold, maximum display threshold, and filter flags) from one Filter Definition File (.flt) into another. 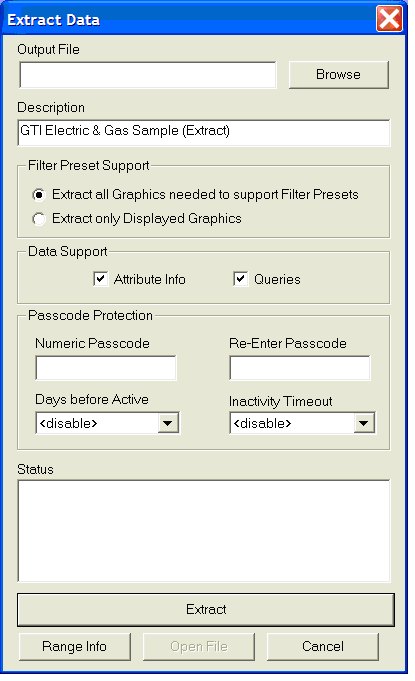 Since filter files have become more complex (as seen in data that is style rule based such as ESRI, Smallworld, and G/Technology), this tool can be very useful in managing the customizable settings. 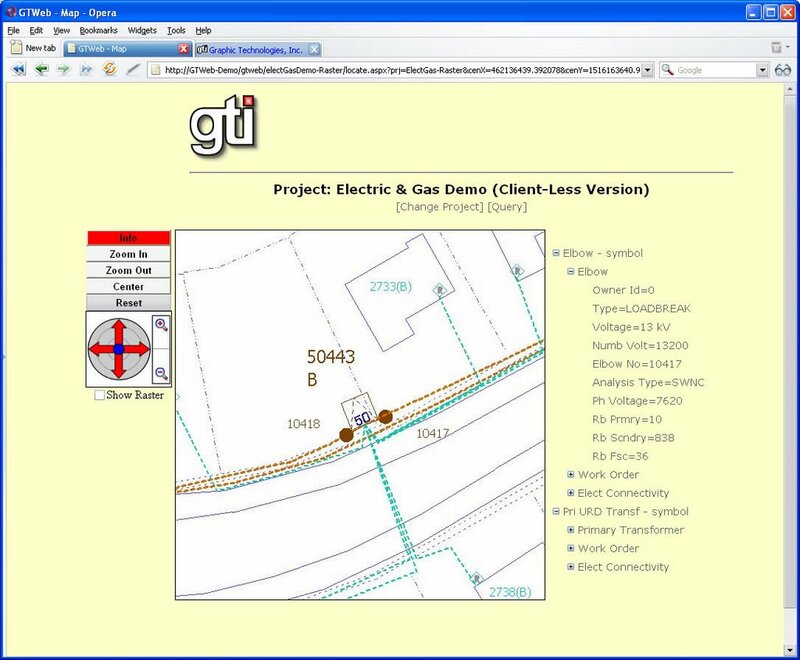 GTWeb Version 5.0 – No Client Software Required! For several years, GTWeb has provided an easy way for a large number of users to access your GIS data with minimal administrative effort. GTWeb has minimal client requirements, requires minimal bandwidth, and is very easy to use. 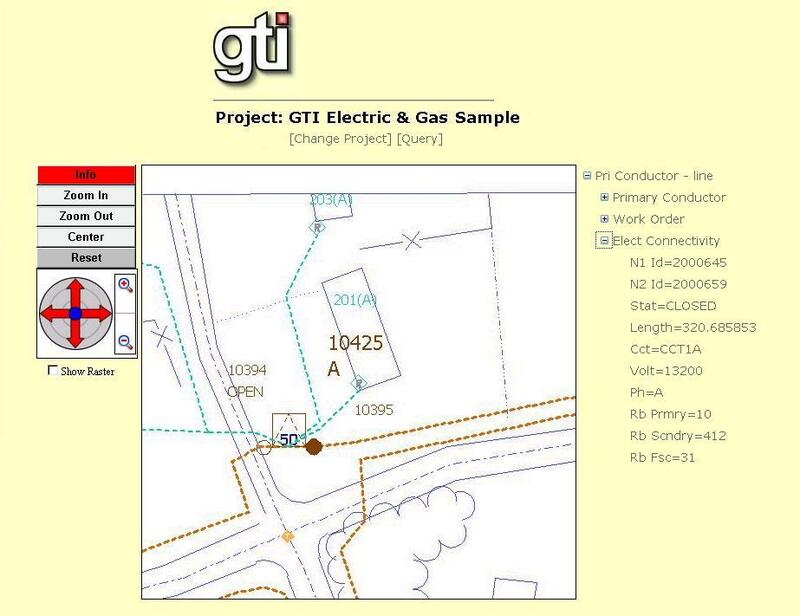 GTWeb version 5.0 provides a significant amount of new features to make it even more effective at what it does best. 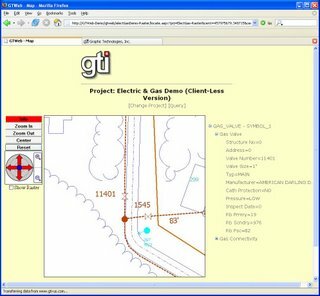 Version 5.0 of GTWeb offers a new approach to viewing your GIS data while still providing all of the functionality of the previous versions. The GTWeb Server can now simultaneously support the traditional GTWeb client that has been available since the product was released as well as the GTSketch client introduced in subsequent versions. The exciting new feature offered by Version 5.0 is a new mode of operation that brings GTWeb to an even greater user base by removing the need for any client component at all other than the browser. 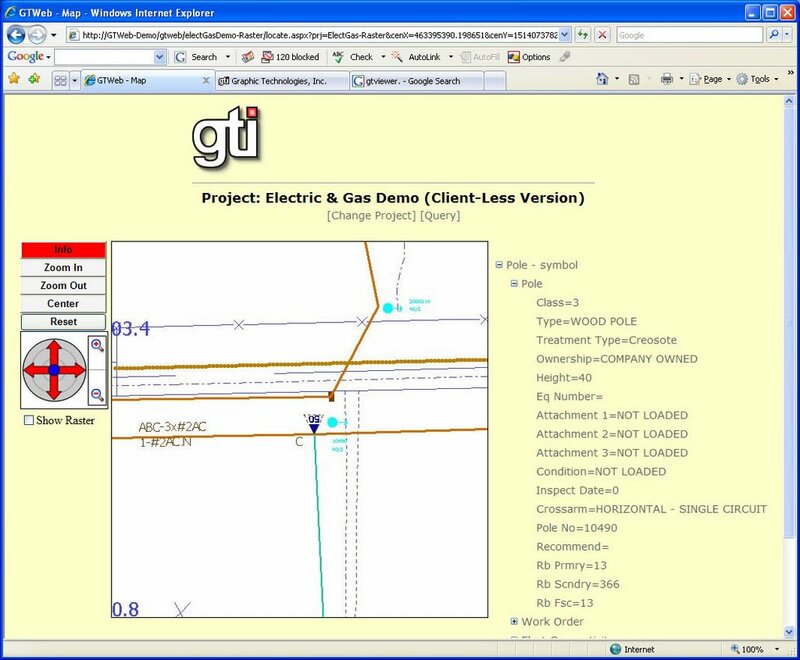 The new "client-less" mode uses ASP.NET 2.0 to interact with the GIS data. It allows queries, panning, zooming, and reviewing of attributes just like the original version. 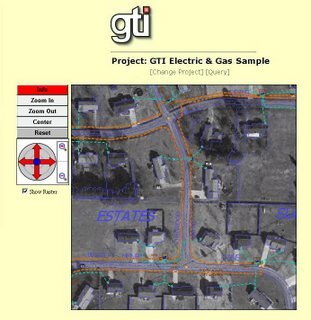 The GTWeb and GTSketch clients still provide a richer experience for the user (since they are very similar to GTViewer in regard to its viewing capabilities), but the gain in universality offered by the client-less version opens GTWeb (and your GIS data) up to a new, larger class of users. The client-less mode of operation grants immediate access to users without the need to install or maintain any client software other than the browser, and it provides browser independence since it can be used with IE, FireFox, Opera, etc. Query results are now returned as DataSet objects which can be bound to many of the ASP.NET controls such as a DataGrid. This simple change eliminates a significant amount of web page code and complexity while also leverages the power of the ASP.NET controls. For example, a DataGrid can easily sort by column and automatically break results up into multiple pages. Another significant new feature provided by GTWeb version 5.0 is that all of the server side functionality is available in the form of a Web Service. A Web Service is a self-describing software component that makes its functionality available over the internet in a platform independent way. A variety of development platforms (such as .NET and Java) can consume a web service and incorporate the web service’s functionality into a web page, a desktop application, a device application, or anything that can use web services. 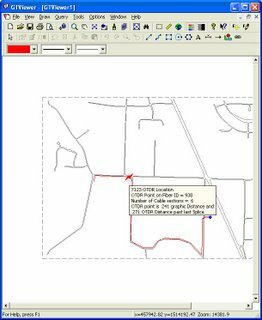 By providing all the functionality of the GTWeb Server component, a new approach to getting your GIS data on the web and into other applications is now available. Join us at the 2006 Smallworld Americas Users Conference, September 24-27. This year the conference returns to the attractive Omni Interlocken Resort near Denver, Colorado. 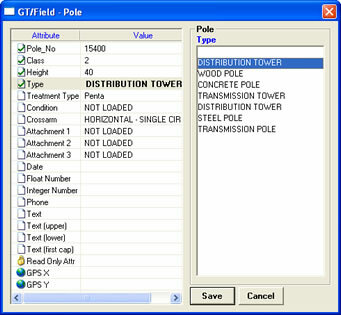 GTI will be showing its configurable data collection application GT/Field, the new GTWeb 5.0, and the rest of the GTViewer Family of Products that help companies gain more value from their geospatial data. GTI will also be showing its solutions including the new Fiber OTDR Trace application that allows a field technician to find the location of breaks and splice problems. Come see Loop Makeup, Gas Valve Isolation, Outage Analysis, and more. Version 5.0.x.8 of GTVx is available. - NEW - Right Mouse Cancel is now supported during rendering. - FIX - The .GTS session files did not correctly save Leader Line elements. - FIX - Connectivity Query and Offset Query would not find a record if it were the first record in the file. Problem introduced with very large .gtx file support was enhanced (4.0.0.6). GTRead is a Windows ActiveX Control that reads GTViewer graphics files (.gtg) and Extract files (.gtx). GTRead is part of the GTViewer-SDK and can be used to add the cability of reading GTViewer data into any application as long as the development platform supports ActiveX controls. Version 5.0.0.2 of GTRead uses the GTViewer 5.0 core and contains several fixes. The next version of GTData will contain 3 new utilities: GTTabImport, GTMergeStyles, and GTStyleMgr. GTTabImport provides a method to import custom changes from one Table Definition Files (.tab) file into another. 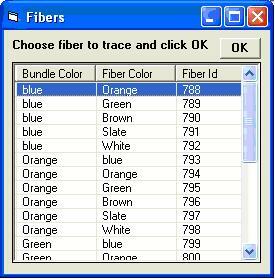 Custom changes include alternate table names, alternate attribute names, display order of tables, and display order of attributes. The Table and/or Attribute must exist in the main .tab file before it will be imported from the import file. The GTConfig.exe utility has the capability to import custom changes from one .tab file to another, but it has a GUI and could not be run on the command-line or in scripts. The GTTabImport utility takes this feature of GTConfig.exe and makes it scriptable. GTMergeStyles provides an easy method for merging multiple style.def and style.map files together. 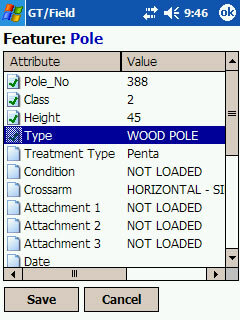 This task could be performed by the Style Manager in GTViewer; however, with this utility, the process can be scripted. The Chop option can be used to remove a string from the beginning of a style definition name (both in the .def and .map files). Some of the conversion tools (like the G/Tech converter, and the FME plug-ins) use filter id names that match style definition names. It is possible to create your filter id name/style name with a prepended string that is useful for the filter name, but not necessary for the style (since the style could be reused by several different filter ids). The chop option will simply remove this prepended string from the style definition names leaving the filter ids intact. The Strip option can be used to remove a square bracket enclosed string ( […] ) at the end of a style definition name. The style definition name will be updated in both the style.def and style.map files. This option is useful in a specific case where a features state (in service, proposed, retired, etc.) is appended to the filter id and style name. It may be useful to control the display of features by state, but they may not use different style definitions. 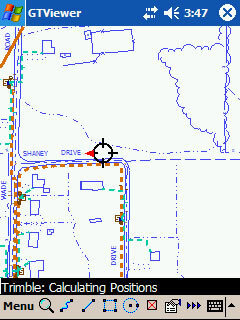 The Strip option will remove the bracketed name in the style.def and style.map. The Thin option is a replacement for a previous tool called GTStyleThinner which looked at all definitions in the style.def and deleted any definitions that were not referenced in the style.map. This process of thinning the style defs can reduce the overall size of the style rules in a dataset (sometimes important on the device platforms). The Fill option can be used to populate only the empty style definitions in a style.def from another style.def file. The Import option can be used to import another style definition file. 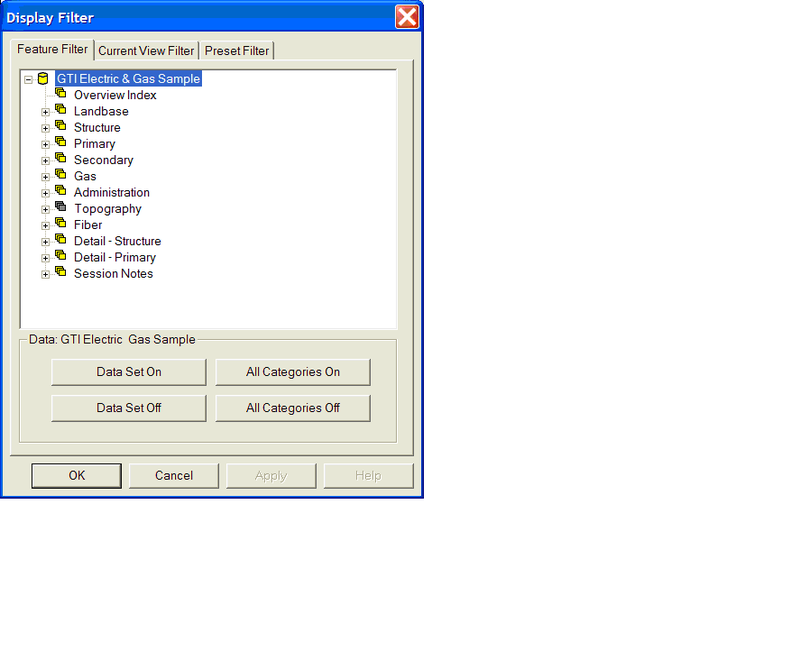 This option works identically to the Import Option in GTViewer when the import only if exists command it used. Therefore, only styles that already exists (empty or not) in the original style.def will be imported. Version 5.0.x.20 of GTViewer is available. - NEW - Improvements to the Display Cancel mechanism (Right Mouse click during render). - CHG - Update to the status bar progress messages. - FIX - GT/Field did not correctly create Text element from Symbols when the SymbolAsText option was used. - FIX - The Print Dialog's Force Black and White option was causing color fonts to display as mono-color fonts. - CHG - Minor adjustments to roundoff error with font and symbol rendering. ReadOnly property can be 1 or A (for all), E (for Edit), N (for New). GT/Field path and FilterString are now stored in extracts. Captured_X and Captured_Y can be used as types with Point features. Feature Definition and Picklist files can now be placed in sub-directories. GTFieldAuditFile can be specified in the .GTM's Additional Properties. GT/Field licensing has been added. Symbol to Text conversion (for edited symbols) did not account for the style scale if the height and length multipliers were default values. 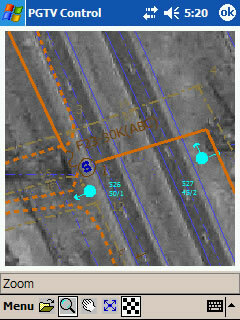 GPS_X and GPS_Y are were not cleared for Point features. Style paremeter in the Feature Definition files was defaulting to -1. - FIX - UpdateElement and DeleteSessionGraphicElement did not work correctly if the size of the element was 0 by 0 (no width and no height). 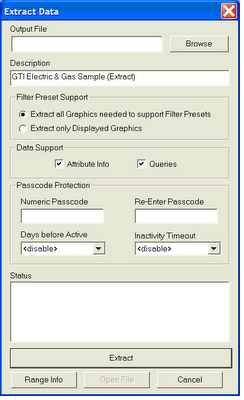 - FIX - DeleteSessionGraphicByKey and DrawSet2KeyLinkage did not work. 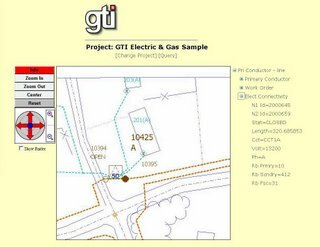 GTI announces a new development tool aimed at the handheld device market. On the Desktop/Laptop platforms, GTViewer is our off-the-self viewing and analysis product. While GTViewer is easily extended with custom applications, GTI also offers the GTVx ActiveX control to provide an even greater degree of control over the development process. GTVx can be used to create standalone applications, or it can be embedded into your existing applications to provide GTViewer functionality wherever you may need it. The same level of development control provided by GTVx is now provided for the handheld platforms (Windows Mobile 2003, Windows Mobile 2003 SE, and Window Mobile 5.0). Pocket GTViewer (the off-the-shelf product for devices) provides a sophisticated interface for creating VB.NET or C# applications to extend its functionality. 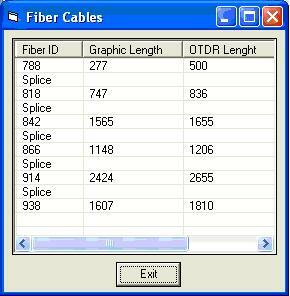 Our GT/Field product was developed using only this interface, and it successfully all requirements. However, users have wanted more control over this development process just as they did in the form of the GTVx control on the desktop. The key feature missing from the Pocket GTViewer interface was the ability to actually embed Pocket GTViewer into your own applications (rather than interfacing with Pocket GTViewer). This ability is now supported with the Pocket GTViewer Control. The new Pocket GTViewer Control is a .NET control for Smart Device Applications and can be used with VB.NET or C#. While similar in concept to GTVx, the PGTVControl is a lightweight implementation geared specifically for handheld devices. It currently supports Visual Studio .NET 2003, and a Visual Studio .NET 2005 version will be supported soon. The first version of the control is a view only tool, but redline support will be available soon as well. Simply place a PGTV_Control on your form as shown above. This C# example (VB.NET is very similar) illustrates how well the Pocket GTViewer Control integrates with Visual Studio. Most of the code here is getting the file name to open with a standard .NET OpenFileDialog. Invocation of the OpenFile and ActivateZoomMode methods in the Pocket GTViewer Control are the only lines needed to get a fully functional viewing component in your Windows Mobile application. Blog postings have been a bit slow over the last few weeks, but this doesn’t mean software development has stopped. In fact, it means very much the opposite. This posting will be brief, but I will take some time to show off some of the new stuff. GT/Field now runs on both GTViewer and Pocket GTViewer. 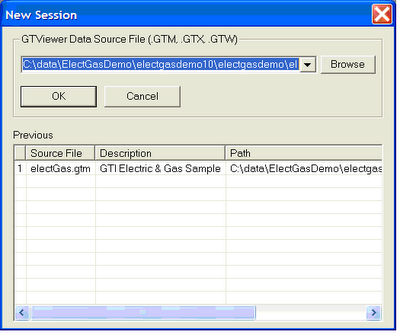 GT/Field is a parameter driven add-on for GTViewer and Pocket GTViewer to facilitate the collection of data. 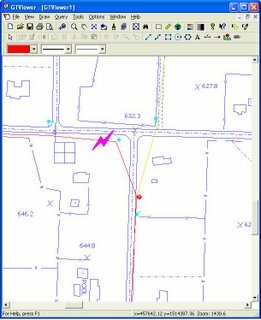 Such data might be field inventory, pole or valve inspections, joint-use identification, GPS point collection or rectification, etc. Data collection with GTViewer and Pocket GTViewer is not new. What makes GT/Field different is that it does NOT require any development or programming to use. Simply define what fields you want to capture for which features and you are ready to go. 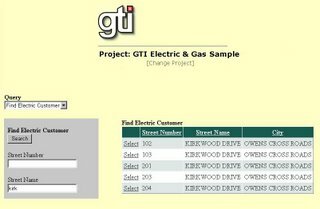 GT/Field was developed first for Pocket GTViewer since the handheld device is an ideal platform for data collection; however, the need to collect data is just as important for GTViewer on laptops. The following screenshots are showing test features, but hopefully they will illustrate the simplicity and effectiveness of the approach.